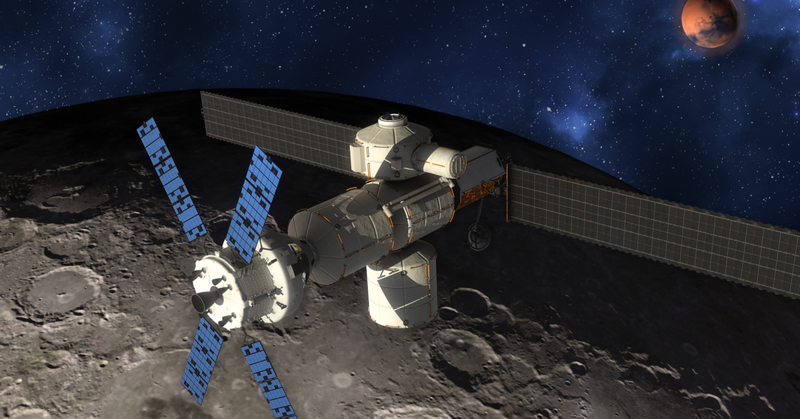 Artist rendering of Lockheed Martin's vision for NASA's deep space habitat orbiting the Moon. Elon Musk just booked his first SpaceX tourist to head to the moon, and Musk also has plans to get to Mars. He is not alone. NASA is on the job too. 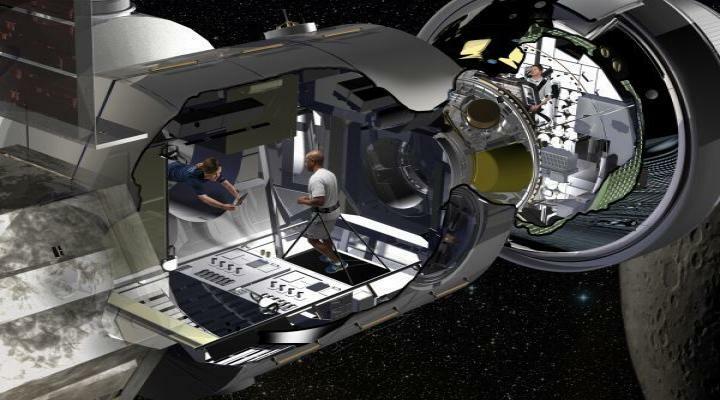 A first round of prototypes for deep space habitats to one day carry humans to Mars will be delivered by a group of contractors to NASA for testing in 2019, NASA spokesperson Kathryn Hambleton tells CNBC Make It. The renderings of the deep space habitats are fascinating. 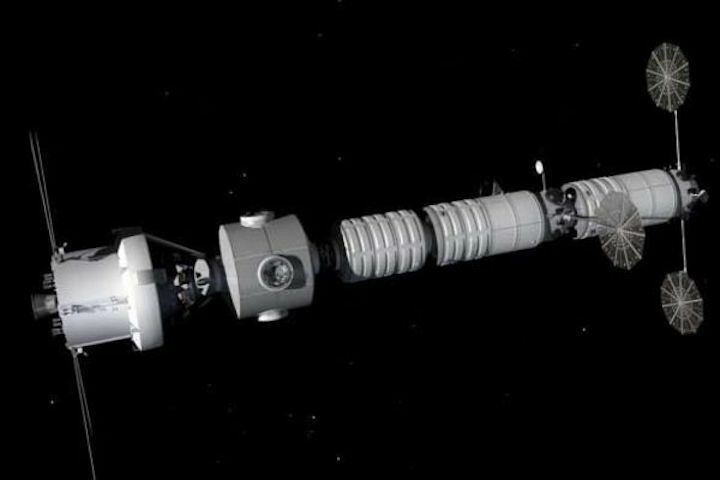 NASA released its own rendering (embedded below) in 2016, when it announced the selection of a handful of private space companies — Bigelow Aerospace, Boeing, Lockheed Martin, Northrop GrummanInnovation Systems (formerly Orbital ATK), Sierra Nevada Corporation's Space Systems and NanoRacks — that would come up with the prototypes for deep space habitats. Conceptual image of a deep space habitat interior from NASA. 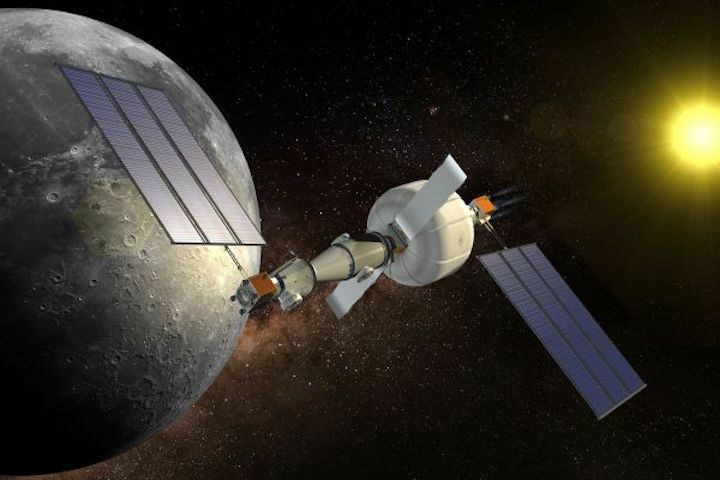 The partnership between the public companies and NASA is called NextSTEP and aims to support "commercial development of deep space exploration capabilities to support more extensive human spaceflight missions in and beyond cislunar space —the space near Earth that extends just beyond the Moon," NASA says. One of the specific projects for NextSTEP is habitation systems, which "provide a safe place for humans to live as we move beyond Earth on our Journey to Mars," NASA says. "NASA is on an ambitious expansion of human spaceflight, including the journey to Mars, and we're utilizing the innovation, skill and knowledge of both the government and private sectors," said Jason Crusan, director of NASA's Advanced Exploration Systems, said when the companies were announced. In August 2016, the companies were given "approximately" 24 months to deliver the results of their innovative work. In August of this year, Lockheed Martin, the aerospace company, officially announced it started "bending metal" (a.k.a, started construction) on its prototype, company spokesperson Danielle Hauf tells CNBC Make It. 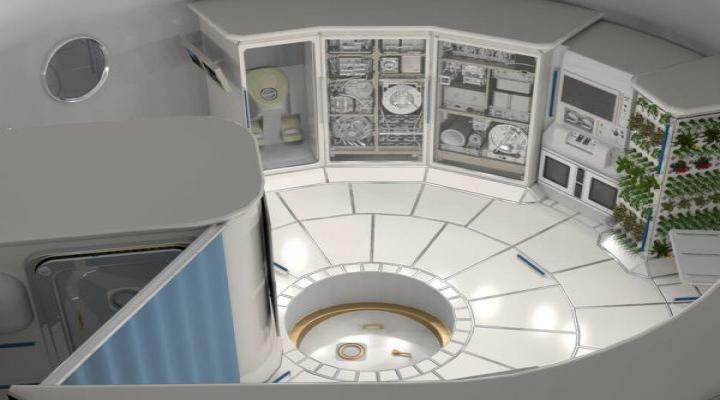 The interior of Lockheed Martin's lunar module — the capsule astronauts would live in on their way to the moon (a rendering of which is embedded below) — is also a template for the prototype Lockheed Martin will use to build a habitat for taking humans to deep space. Artist rendering of the interior of the Lockheed Martin's lunar habitat in orbit around the Moon. "We would use the lunar habitat to prove out the technology to serve as a baseline for habitats for future deep space missions beyond the Moon," Hauf tells CNBC Make It. "Everything for the NextSTEP contract is to validate technologies to eventually go to Mars. 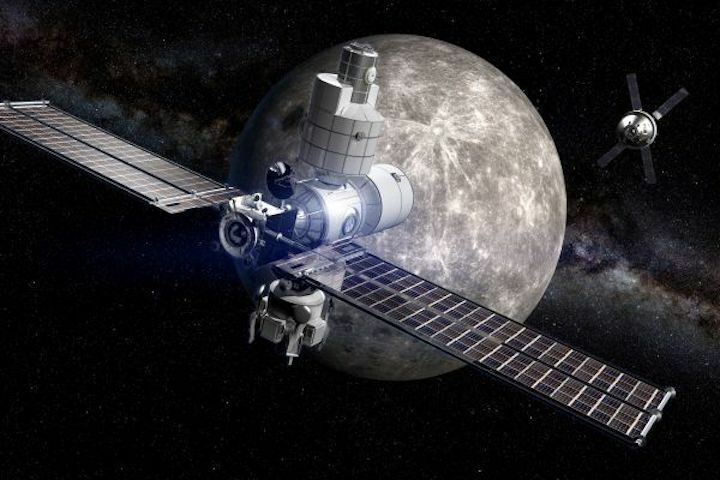 Cislunar, or anything around the Moon, is a perfect proving ground because it still has the challenges of communications delays and radiation that aren't the case with low-Earth orbit. "Also, with a sustained presence at the Moon, that will be used as a stop for longer duration missions. We like to call it a 'space port' — like an airport — for other destinations," she says. Living in space requires special technologies for everyday activities. 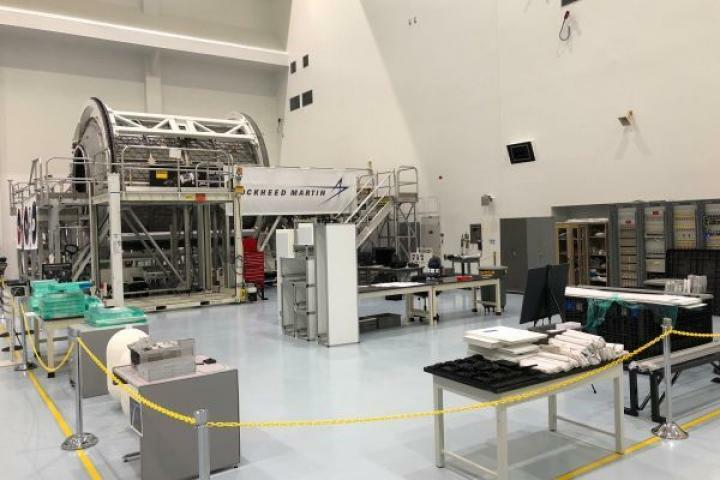 "It is easy to take things for granted when you are living at home," said Bill Pratt, Lockheed Martin's NextSTEP program manager, in a written statement released in July announcing the development of the prototype. "Something as simple as calling your family is completely different when you are outside of low Earth orbit. "While building this habitat, we have to operate in a different mindset that's more akin to long trips to Mars to ensure we keep them safe, healthy and productive." The deep space habitat has specific regions to accommodate particular needs of the astronauts. "There is storage for food and other living essentials, a crew sleeping area, a robotic workstation, a fitness area (on the ceiling) as well as an area for other science experiments. Also, since this is a deep space habitat radiation shielding is critical compared to other low-Earth orbit systems, so some of the storage would be dual purpose to protect against radiation," Hauf tells CNBC Make It. 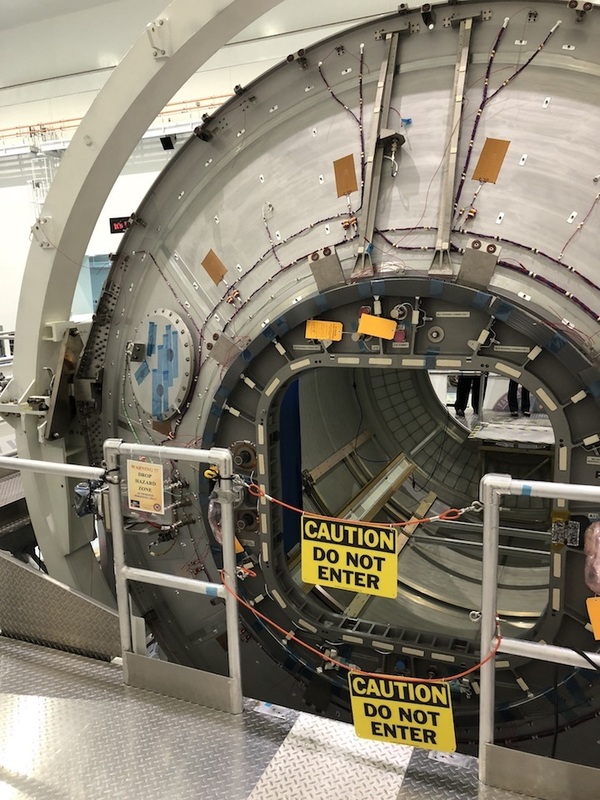 Here are photos of the Lockheed Martin deep space module being constructed in the Kennedy Space Center in Orlando, Florida. The exterior of the module Lockheed Martin is using to develop a prototype for the deep space habitat. And here's an artist rendering of the deep space habitat prototype from Lockheed Martin orbiting the moon. Below are three more artist renderings of the outside of deep space habitats from Boeing, Sierra Nevada Corporation's Space Systems and Northrop Grumman Innovation Systems, respectively. These companies did not share images of the inside of a deep space habitat. An artist rendering of the deep space habitat Boeing is building. Image courtesy Northrop Grumman Innovation Systems (formerly Orbital ATK). Artist rendering of the deep space habitat exterior from Northrop Grumman Innovation Systems (formerly Orbital ATK). One company on the NASA roster to come up with prototypes, NanoRacks, is building space habitats with "space junk," or spent materials that otherwise burn up on reentry. "[T]hese are huge, voluminous, advanced structures that cost millions, and today we just throw them out," Abby Dickes, spokesperson for the Houston-headquartered commercial space company, tells CNBC Make It. "Upper stages cost around ~$50M US, and today, they complete their primary mission (such as deploying a satellite), and then fall into their re-entry burn. Instead, with our program, the upper-stage would get a second life, in which some pre-outfitting on the ground would allow us to keep the upper stage in orbit and convert it into a habitat. Some habitats could be permanent, and allow for fuel re-servicing to remain in orbit, or maybe some have a set life span and de-orbit after a few years – for us, it's about what the customer wants," Dickes explains to CNBC Make It via email. In its response to NASA, NanoRacks is specifically working on "low-Earth orbit (not immediately Mars, as some others are focused)," according to Dickes. "Looking at all the plethora of vehicles we have going to orbit — each has an upper stage, and each has the potential to be a commercial outpost. This means at a very low-cost, we can make unique, customizable outposts that can be driven by customer and market needs, all throughout the solar system," Dickes tells CNBC Make It.